A handmade felt needle case with a delicately embroidered flower design. It fastens with a beautiful, handmade Dorset button and a wraparound cord. It has four pages of felt to keep your pins and needles safe and comes in a gift box. These hand stitched wool felt Easter decorations are available to buy from my Folksy shop but I have also made a free pattern on my website. The pattern is a perfect Easter holiday project for teens and tweens. 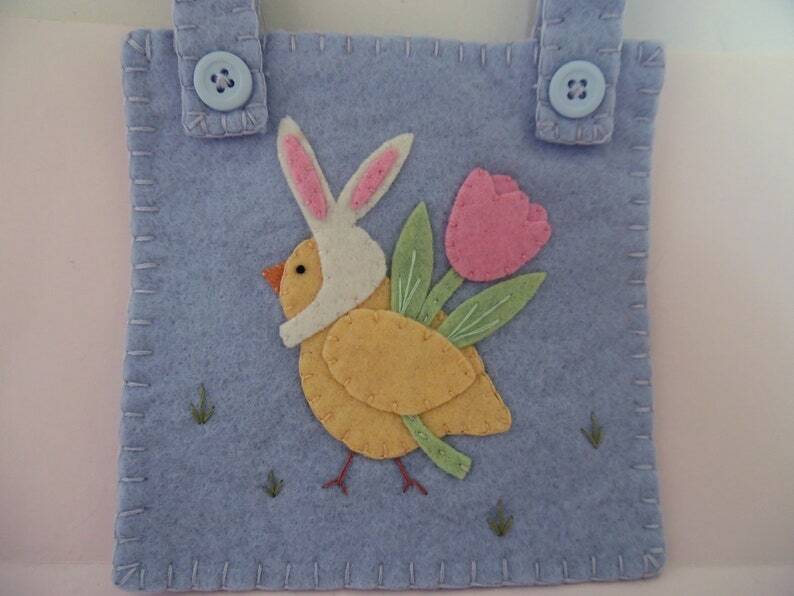 This adorable easter wall hanging is made from top quality wool felt. This cute wall hanging features an adorable chick dressed up with bunny ears and holding a pastel pink colored Tulip with mint green leaves. Each pieces is hand cut and hand appliqued using DMC embroidery floss. Made from high quality wool felt from national non-wovens which has been felted by me. Every single piece is hand cut, each tiny pink bow was made special to fit the tiny bunny's. Each bunny has a hand needle felted tail and I used 100% raw wool to give them a bit of depth and extra fluff ! This handmade cushion features an embroidery design of a pair of maple leaves in bright autumn colours. The cushion is made from a striped brown and gold fabric and a lovely warm brown fabric, arranged in a patchwork style around the embroidered centre panel of cream fake suede. 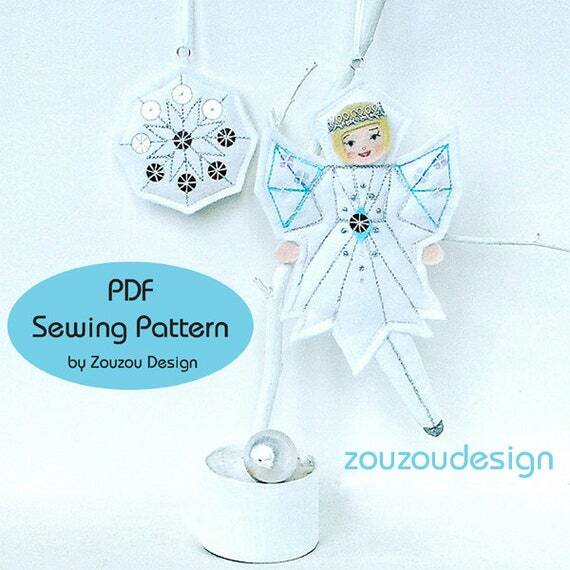 These delicate little felt frost fairy and snowflake ornaments are fun to sew and make lovely decorations for the home especially at Christmas time. They are straight forward to make and the pattern contains a step by step photo tutorial, material and supply list and full size pieces. This hand-made cushion features an embroidery design of some birch leaves, in their bright autumn colours. The fabrics used to make the cushion are a brown and gold striped fabric and a lovely warm brown embossed fabric,which are arranged in a patchwork style around the centre embroidered panel. This cushion features a beautiful machine embroidery design an a spray of Peonies. The cushion is made out of cream fake suede with a cream polyester cotton back. It comes complete with a feather cushion pad. A baby quilt in a colourful pinwheel design, with an attractive quilted pattern. Made from a selection of bright cotton fabrics with a border of vintage style fabric, ideal as a gift for a baby girl, or older toddler. The backing is a pink cotton and shows the quilting design in more detail. The inner layer is 4oz weight polyester wadding giving a soft, warm but lightweight quilt. This hand-made cushion features a very detailed embroidery design of a Tabby Cat. The cushion is made out of light grey fake silk and darker grey linen, arranged in a patchwork style around the centre embroidered panel. This hand-made notebook cover features a machine embroidery design of Poinsettia flowers and leaves, with the wording Christmas book embroidered above it. The cover is made out of a rich brown fake suede and comes complete with an A5 lined notebook and pen. This hand-made cushion features a beautiful embroidery design of a sprig of purple pansies. The centre embroidered panel is surrounded by green fake silk and a darker green linen arranged to create a patchwork effect. The cover of this garden notebook is hand-made and features a machine embroidery design of a sprig of crocuses. The words "Garden Notes" are also embroidered. The A5 notebook and pen are included with the hand-made cover.